We tracked GEVO to some nice gains late this spring, and re-admitted the stock into the conversation in yesterday’s report. We were met with a respectable intraday increase as it traded up from a low of 2.37 to a daily high of 3.00. It registered as an opportunity of single session gains of up to 27% on volume of more than twice the 3-month average. The stock is pulling back slightly in the premarket today, but we could see some further chances from this play into next week, provided it can continue to build a higher base of support in coming sessions. We’ll want to see the stock maintain above yesterday’s swing low of 2.37 to remain interested at the moment. We spotted some potential in PSTR after catching it on a routine scan recently, and thought it’d be a good time to mention it as it is coming up off of recent relative lows. The stock ran into some resistance just a tick below its 50DMA of 2.76 yesterday, and that’s going to be the figure we watch for a break. A move past that point, and there doesn’t seem to be much standing in the way of this low-float play running up to the level of its current 200DMA, presently sitting at 4.01. 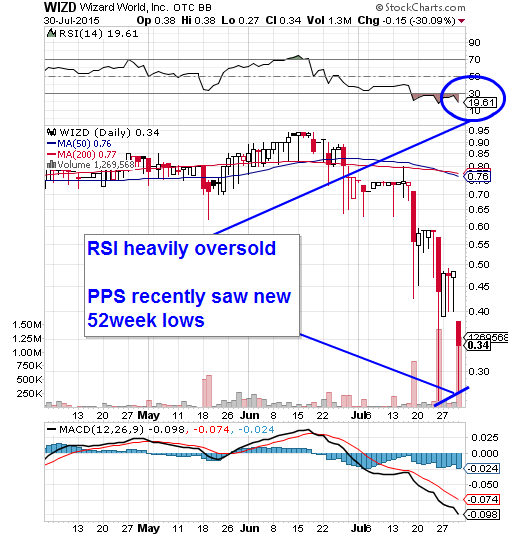 WIZD is a stock that has recently been beaten back to new 52-week lows, and as our regular readers are well aware, we’ve had an exceptional amount of success in the past with stocks in just this position. As you can see on the prepared chart below, WIZD is drastically oversold at the present time, and trading at just a fraction of its moving averages. LinkedIn Corp. LNKD – Despite a hefty beat on earnings and raised guidance by the company, LNKD shared slipped more than 5% during yesterday’s session. The reactionary slide was primarily due to the perception of weakness in some of the areas of LinkedIn’s core business. Despite that fact, we want to offer up a longer-term options idea relating to the stock’s potential recovery over the next several weeks. We’re going to give specific attention to LNKD Sept. 11th $210-220 Calls. GoPro, Inc. GPRO & Expedia, Inc. EXPE – Both of these stocks are gapping up in the premarket this morning, so as a closing idea for the week we’ll be monitoring Weekly Calls in each of them for a possible dip-and-rip. Those ranges of highest interest to us are GPRO $63-64.50 Calls, and EXPE $115-117 Calls. Don’t forget about the success we’ve had this week with the Weekly Ford (F) $14.50-15 Calls, and Weekly MU $19.50-20.00 Calls. We’ll have our eyes peeled for the possibility of seeing some added spikes as the trading week comes to a close. To start things off today we’ll be going over the continued success of our running options ideas for the week. During market conditions like the ones we’ve been seeing, oftentimes big gains from stocks can be fewer and farther between, so it’s nice to be able to fall back on options trading. Quarterly periods where earnings reports are dropping with the highest frequency really provides a lot of great chances for quick strike profits. Ford Motor Co. (F) - Ford has been an excellent example of a massive gainer in a short span. We’ve been tracking F Weekly $14.50 and $15 Calls since Tuesday, at which time we observed lows of .18 and .02 respectively. After the $14.50′s made huge gains possible for us that day, the $15′s joined in yesterday and both sets went haywire. The $15′s traded in a massive range from .05-.32, giving daytraders a shot at gains of up to 540% on the session, and giving us yet another multi-bag call in what has been a landmark week for our options-trading ideas! Pfizer, Inc. PFE – We also offered suggestions for Pfizer in the same Tuesday report, the PFE Weekly $34.50 and $35 Calls. We saw lows of .26 and .10 respectively for those contracts. Yesterday, new highs were set in both cases, with the $34.50′s making a total move of 476% to 1.50, and the $35′s ramping up to the tune of 970% as they surged as high as 1.07. Micron Technologies, Inc. MU - For MU we drew attention to Weekly $19-20.50 Calls and were met with some nice opportunities there also. $19.50 ran from .75-1.10 (+47%) and the $20 Calls traded in a range from .40-.75 (+88%). MBHC has released a fresh PR this morning that we’ll suggest all our readers take a look at, as it pertains to the company’s ‘Whirld’ app which, if everything remains in step with the timeline previously given by MBHC, is slated for official launch in mid-August. Ford Motor Co. (F) - On the heels of the revelation that Ford had set revenue records and beat earning expectations for Q2, we saw the chance to leverage the resultant action on the chart to our great advantage. The range of contracts that we flagged for observation was the F Weekly $14.50 and $15 Calls. As the $15′s fell just shy of being pushed into the money, the main thrust of the action was in the $14.50′s. Those contracts went big, with a surge from a low of .18 all the way up to .42; an intraday spike of 133% We’ll be on the lookout for potential dip-and-rip scenarios in Ford to create the possibility of further opportunities as the week wears on. Pfizer, Inc. PFE – it was also a beat on earnings that propelled our PFE ideas to substantial intraday gains. Our specific area of interest were the PFE Weekly $34.50 and $35 Calls. The $34.50′s made an impressive move from .26-.88 for total possible gains of 238% and the $35′s really performed with a monster 410% run from .10-.51! We also want to make a quick note of the PZOO news that hit wires right at market open yesterday. The storyline we’ve been continuously following with Pazoo regarding the company’s foray into the medical marijuana testing business received a significant update. WHIPPANY, N.J., July 28, 2015 /PRNewswire/ – Pazoo, Inc. (OTCPink Symbol: PZOO) is pleased to announce that wholly-owned subsidiary Harris Lee, LLC has signed a sublicense, and loan agreement with Harris Lee Colorado, LLC (HLC). These agreements now allow HLC to meet the in state residency requirement and provide for the necessary funding to take over the testing lab, expand the marketing and employment base and begin the expansion of the operations. PZOO has been progressing well in the past several sessions since we last touched base with the stock a couple of weeks ago. We had just received word from the company that its wholly-owned CannabisKing Distribution subsidiary had struck two significant deals (Links to PR’s below), and witnessed a two-session swing of 74% as a result. 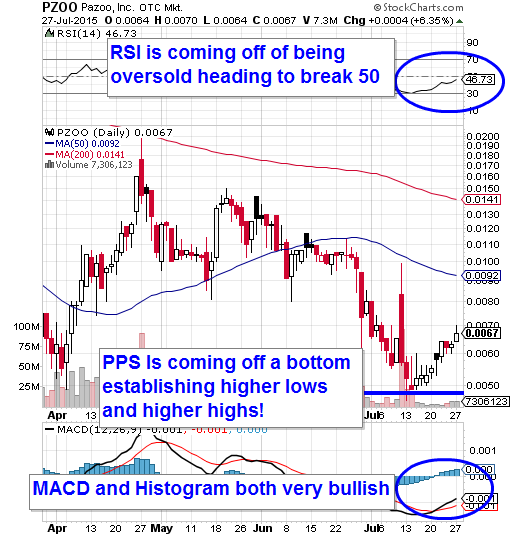 After regrouping and bouncing off of a low of .0046 (07/13), PZOO has made continuously higher lows for the rest of this month, and pushed its PPS back to the current range (.006-.007). 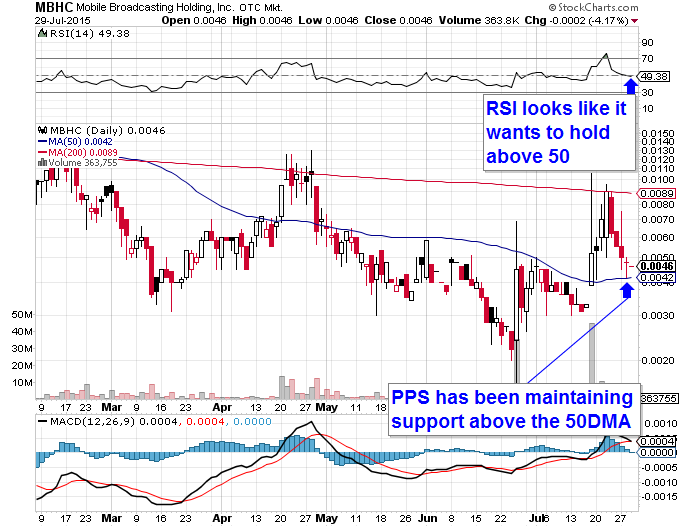 We’ve provided the following snapshot illustrating the current bullish characteristics of the chart. We’ll be on the lookout for further updates regarding the many irons PZOO currently has in the fire, and you can be sure that we’ll pass them along as the stories develop. Ford Motor Co. (F) - Ford set record North American profits and beat Wall St. expectations handily this morning. The stock is gapping up moderately, so we’re going to taking a look at F Weekly $14.50 and $15 Calls, which should produce some nice action. Pfizer, Inc. PFE - Pfizer also had an earnings beat on their Q2 release today, and our related options ideas will be to monitor PFE Weekly $34.50 and $35 Calls. Baidu, Inc. BIDU – After an extreme analyst downgrade, BIDU is taking an absolute beating, and is leading us to include a rare idea on the bearish side of things; we’ll be tracking BIDU Weekly Puts in the $180-175 Range. We also want to raise a flag on a familiar stock cropping up in the news feed this morning. Early this year we saw CYTX make a huge move, and after spending the last several months in a general downtrend, some FDA-related news out this morning could be just the thing to catalyze a reversal. We’ll be watching intently for that possibility; check out the news below. First up this morning is a stock that we called in Friday’s extended watchlist The volatility in CRGP was an excellent target for flippers on Friday, with the stock coming out with a nice initial intraday run before following it up with a couple of subsequent bounces. It began from a morning low of .0043 from which point CRGP rattled off its first swing up to the high-of-day at .0067; a nice 56% surge. After pulling back to .0045, it ran promptly back to .006 adding another 33% pop. It finished up with a dip back to .005 and 20% run-back to .006. We tagged ITEK in Thursday’s premarket report, after noticing some FDA-related news hitting the wires, and during that session we would witness a low of 7.66 before the stock took off on an impressive tear that bled into Friday’s trading as well. On Friday, the momentum carried the stock to a new high of 19.45, which registered as an overnight increase of 154%, so we want to send our congratulations to those of our readers who caught our report and cashed in on that impressive move! The big winners among the options ideas that we submitted in Friday morning’s report turned out to be the FB Weekly $96-50-97.50 Calls . Every one of the contracts in the range we specified turned up chances at impressive profits. Here’s a breakdown of the gains that were made possible by our timely alert. The $96.50 Calls came out of the gate with a nice initial 108% move of from .65-1.35. That was followed up by a significant pullback to its daily low of .07 before running hard back to .58; an incredible 728% surge. The 97.50′s did make a move from .22-.52, an intraday gain of 136%, however they ended up too far out of the money to see a second run like the aforementioned plays. Still, their performance was nothing to sneeze at; any way you slice it, our FB Options ideas from Friday were a huge success!